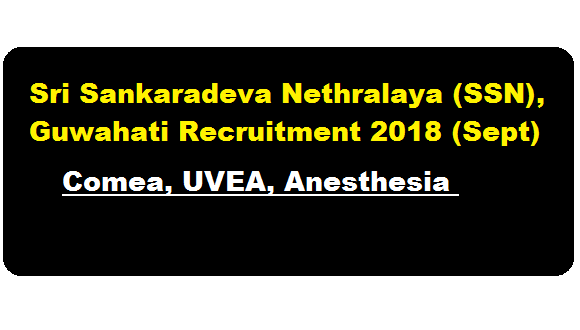 Sri Sankaradeva Nethralaya (SSN), Guwahati Recruitment 2018 (September) | Various Posts :- Sri Sankaradeva Nethralaya Guwahati which is a centre of excellence in eye care is seeking application ‘for full time qualified consultant in clinical and academic position in the following sub-specialty. For Sl. No. 1 & 2, Post Graduate degree (DNB/MS) in Ophthalmology preferably with specialization in respective ophthalmic subspecialty. Last Date of Submission of application- 16.10.2018.